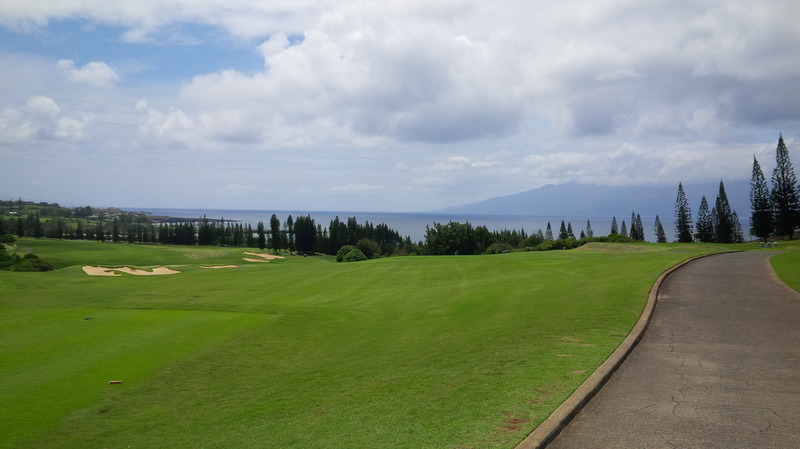 Only a living heart donor could not get enjoyment out of simply setting foot on Kapalua’s Plantation Course. When I booked my tee time to play the famous Plantation Course at the Kapalua Resort, I must admit I was a little skeptical. I had played seaside links courses, and I’d played courses on top of mountain ridges, so how special could this course on a Hawaiian mountain with views of the Pacific Ocean really be? Plus, I’d had so much fun and such a wonderful experience at the highly regarded Harbour Town Golf Links earlier this spring that I knew there was no way the Plantation Course could live up to its much heralded reputation on the heels of such an amazing outing on Hilton Head. I will freely admit it, I was wrong. Kapalua’s Plantation Course absolutely lived up to its billing as one of the best golf courses in the world and exceeded all my expectations. It is an absolutely beautiful corner of the Earth that happens to have a fantastic golf course built upon it. By the time we reached the 1st green, I was already thankful for my Plantation Course experience. 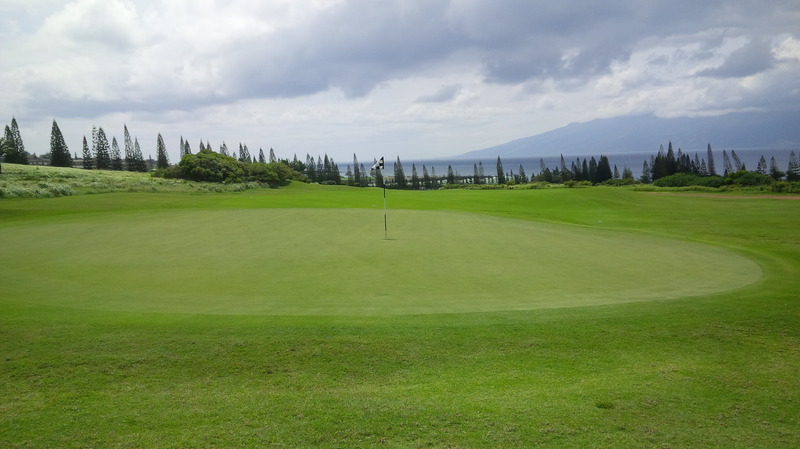 The stop-in-your-tracks majesty of the views of the Pacific Ocean, the mountainous West Maui Forest Reserve, and the island of Moloka’i across the Lahaina Roads bay from various points on the Plantation Course absolutely have no equal from any other golf course I’ve played. And it’s not even close. Ben Crenshaw and Bill Coore get credit for designing the Plantation Course. However, I suspect, if pressed, the noted course architects would probably give most of the credit to the Hawaiian gods. Only a force greater than man could have provided Coore & Crenshaw such a rich, diverse, and near-perfect canvas on which to construct their golf course, which opened for play in 1991. Looking up and being mesmerized by the view in one of the many hazards Coore & Crenshaw cleverly incorporated into their world-class layout. The Plantation Course offers five different sets of tees from which to play. Though I’m starting to hit the ball more consistently with my new swing, I knew I didn’t want to risk having a terrible round by trying to play the Championship tees. 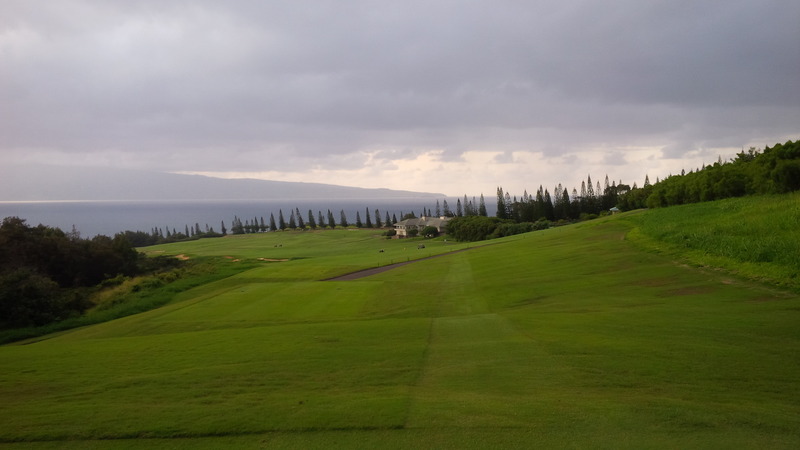 You know, the tees from which the PGA Tour professionals have teed it up for the Mercedes Benz Championship or the Hyundai Tournament of Champions at Kapalua each winter since 1999. From the Regular tees, the Plantation Course plays to 6,674 yards with a course rating and slope of 73.3/140. Despite the obscenely decadent views from the clubhouse and the first tee, the actual golf course grabs your attention from the very start. 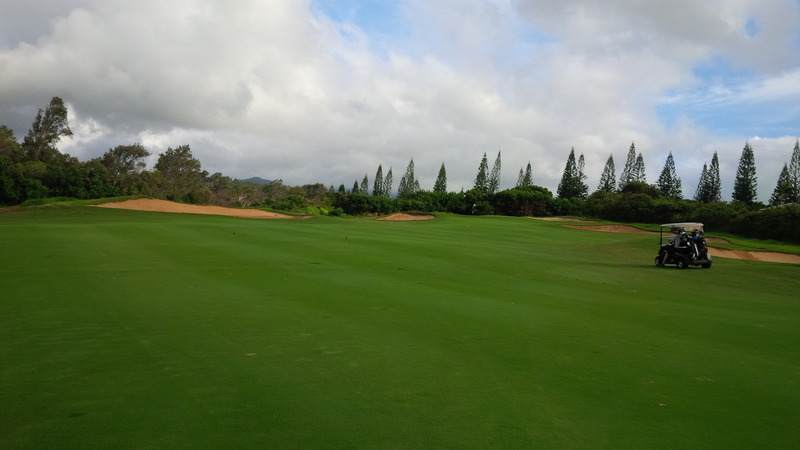 Though possessing traditional resort course qualities of super-wide fairways and light rough, I was acutely aware of the Plantation Course’s score-inflating hazards throughout the round. At a mere 378 yards, the par 4 6th hole is the perfect example of how the architects used angles, elevation change, and extreme green contouring to make a fun, challenging hole out of an otherwise uninteresting distance. The cavernous divides adjacent to and between holes include jungle-quality shrub and tree undergrowth just off the fairways, with several holes requiring golfers to carry or play around foliage filled valleys from which golf balls (and likely golfers) do not return. The course cleverly incorporates elevation changes to challenge the golfer with plenty of blind and semi-blind shots and holes of lengths that force the golfer to make a risk/reward decision. And there always seemed to be a bunker in play on every shot if I missed the target. There are several holes that simply should not be a challenge according to the length on the scorecard. However, those holes pose difficult and dynamic challenges because of the prevailing winds, elevation changes, and strategic bunkering. After playing just one round there, I am convinced that if you took away the amazing Hawaiian scenery and set the Plantation Course’s layout in the wooded mountains of the North Carolina mountains or Colorado’s high country, it would still be a world-class golf course. The closing stretch of both the front and back nines are stocked with real knee-knockers, like the all-carry into the wind 188 yard par 3 8th hole. The consistent quality of the course’s infrastructure, layout, routing, and greens, combined with the fun factor of having so many options of how to attack the course, really set it apart from any other top-notch course I’ve played. For example, in an almost obvious nod to Pete Dye, the Plantation Course contains six par 4 holes that measure at or less than 350 yards from the Regular tees. However, none of those holes, especially the 275 yard uphill 14th hole, are boring, easy, or straightforward. They all force a decision off the tee, and par is a great score on each one of them. The par 3 second hole is the only hole on the course that does not involve serious elevation change from tee to green in one direction or the other. From the 9th green, the otherwise posh Plantation Course Clubhouse somehow fails to live up to the amazing visuals of the mountains, ocean, and islands. 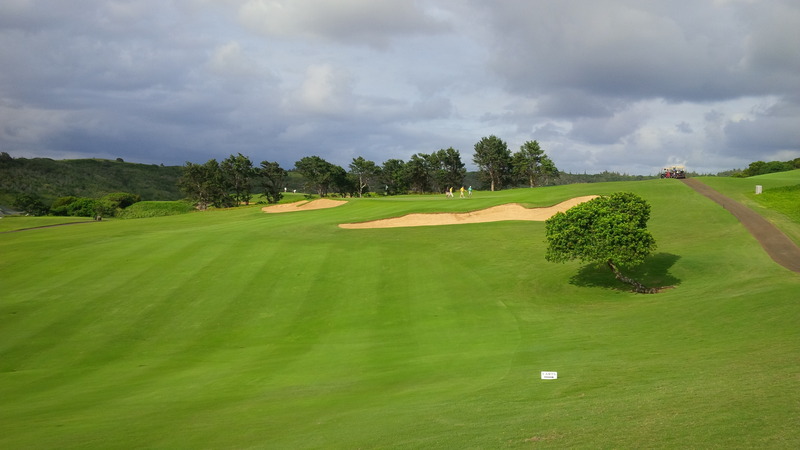 Though visually “boring” by comparison to the rest of the course, even such a seemingly benign hole is turned rugged with intelligent bunkering and severely sloping green contours. For all the strategic decision-making and terrifying visuals built-in to the Plantation Course’s design, it is an incredibly playable and thoroughly enjoyable golf course for an average golfer like, yours truly. However, on the last few holes of each side, the Plantation Course really shows its most difficult tests. Holes number 8 and 9 proved a one-two punch combination right to the gut, using a forced carry and severely uphill green, respectively, to ruin my front nine scorecard. Holes 15 is a long, uphill double dogleg par 5 that requires three relatively precise shots in order to salvage a scoring opportunity. What more could you want from a short par three? Number 17 is perhaps the scariest hole I’ve played this year: 467 yards of par 4 terror, with a mammoth valley separating the end of the fairway from the severely sloping green and a bailout area littered with deep bunkers. 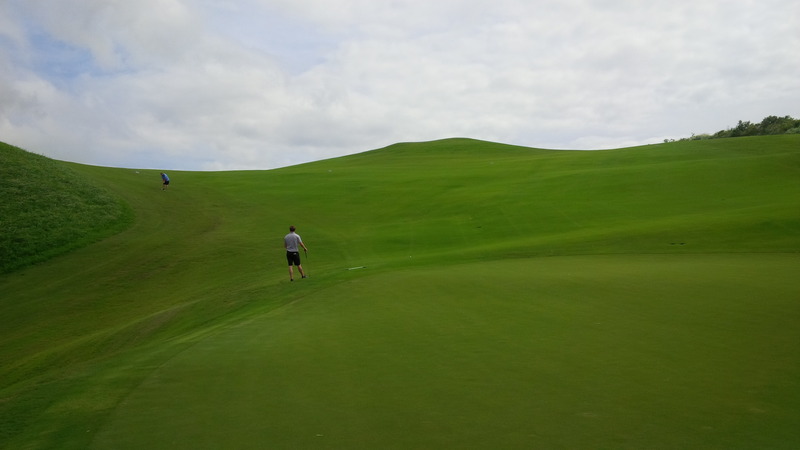 The greens are simply enormous. All of them. And all the greens have incredible undulations, elevation changes, and, of course, the ubiquitous Grain of the Bermuda turf. Reaching any of the Plantation Course’s greens in regulation is a cute statistic, but in no way guarantees par. In fact, I had a handful of three-putts that felt like victories for which I was damn grateful. The elevation changes and undulations are laid out as if the Earth wrinkled just to make a perfect golf course. 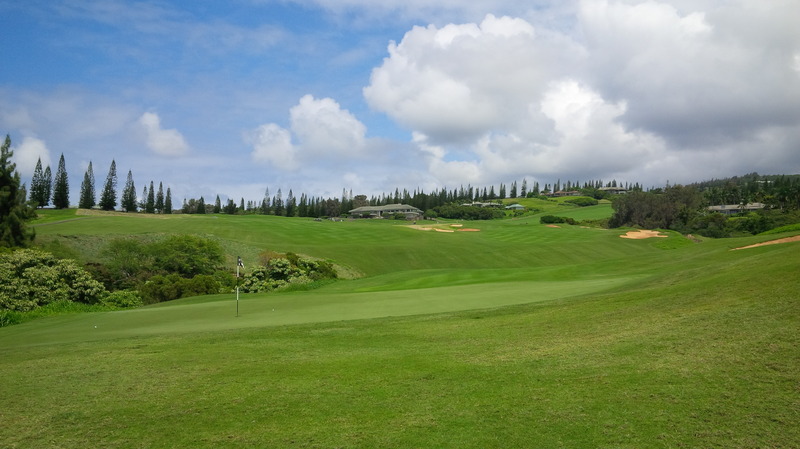 I paid a pretty penny to play at Kapalua’s Plantation Course and rent their bag of Titleist clubs with which to play, but it was money well spent. The grounds were immaculate, the course in pristine condition, and my rented golf clubs were in near perfect condition. The staff was professional, courteous, made me feel utterly welcomed to their course. I have a (relatively) old Titleist 910D3 Driver in my bag at home, so having a familiar looking and feeling driver in my rental set provided a great comfort level for the round. 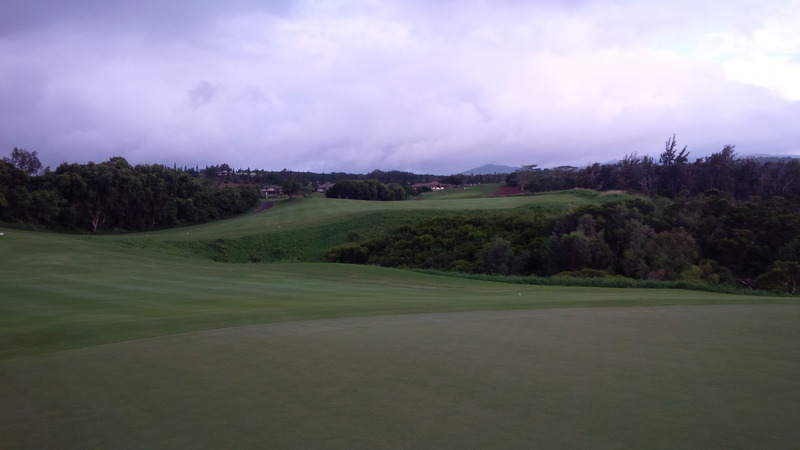 And I drove the ball at Kapalua the best I have it off the tee since I began my swing change this winter. At only 275 yards, I should probably feel worse about my bogey at the par 4 14th hole. But I don’t. However, if I ever travel to Hawaii again, if I don’t pony up to ship all my clubs with me, I may at least pay to bring my wedges with me. The Plantation’s Course’s massive greens put a premium on accurate short game execution that I just never achieved with any regularity. One of the many laughs I had during my round came before my golf round even started. 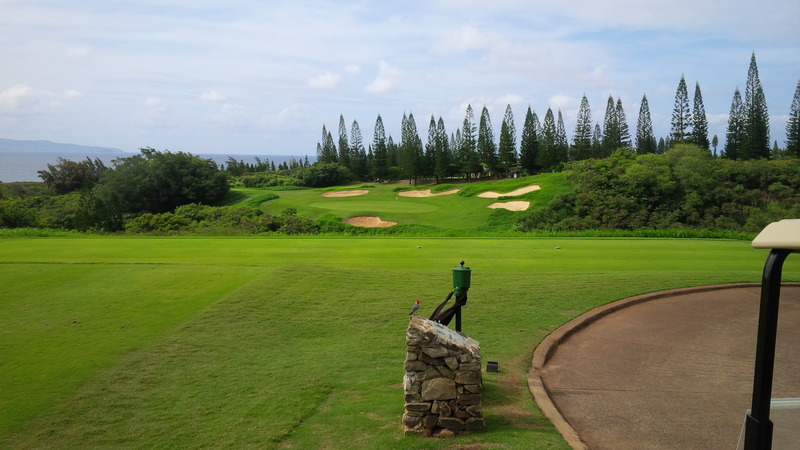 The standard non-resort guest greens fee of $278.00 drops to a more palatable $178.00 after 1:00 p.m. at Kapalua. I couldn’t help but laugh out loud as I joined groups of golfers at a little after 1:15 p.m. lined up at the first tee like planes on the tarmac at Atlanta’s Hartfield-Jackson Airport on the day before Christmas. The double fairway, double dogleg 15th hole proved anything but a “scoring” hole. Also laughter-inducing, upon arrival at the starter’s position I discovered I was one of two golfers named “David Hill” who signed up for early afternoon golf at Kapalua on that particular day. My namesake from Virginia, clad proudly in a Hokie polo, and I apparently wreaked havoc on the reservation system and the starter. But, after a few handshakes and chuckles, we both eventually made it onto the course at our appointed tee times. It took a near perfect drive and a perfect 3-hybrid just to get it on the fringe of the 17th green. 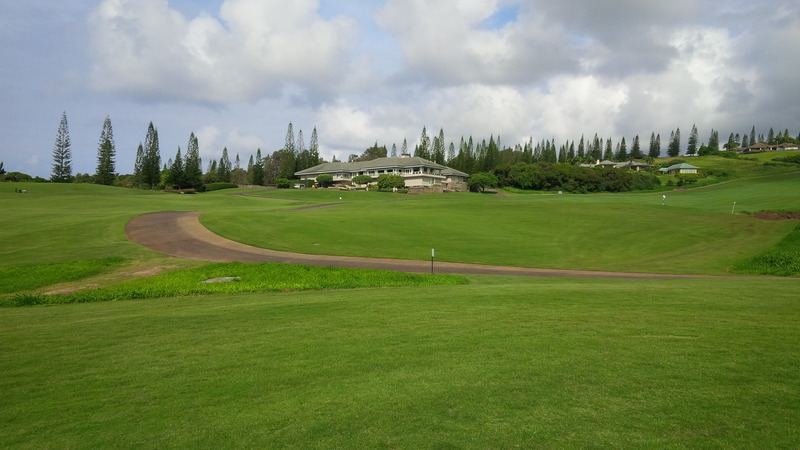 I ended up being paired with a friendly father and son from Wyoming who were as focused on enjoying a beautiful Hawaiian afternoon on the links as they were in challenging the course record. 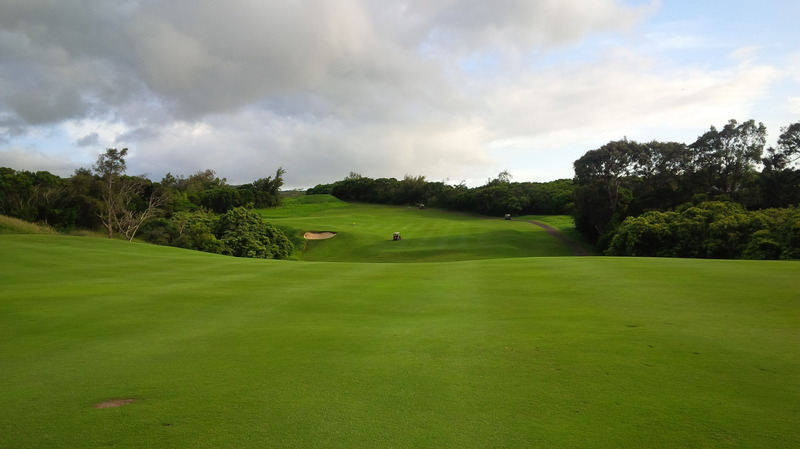 They were great partners to soak in the Kapalua experience. If I had to choose only one golf course that I would play for the rest of my life, I can’t foresee ever choosing against the Plantation Course. I know there are more pure tests of golf and more venerable courses of legend and lore, but for pure enjoyment of a golf experience, my vote goes to Kapalua. 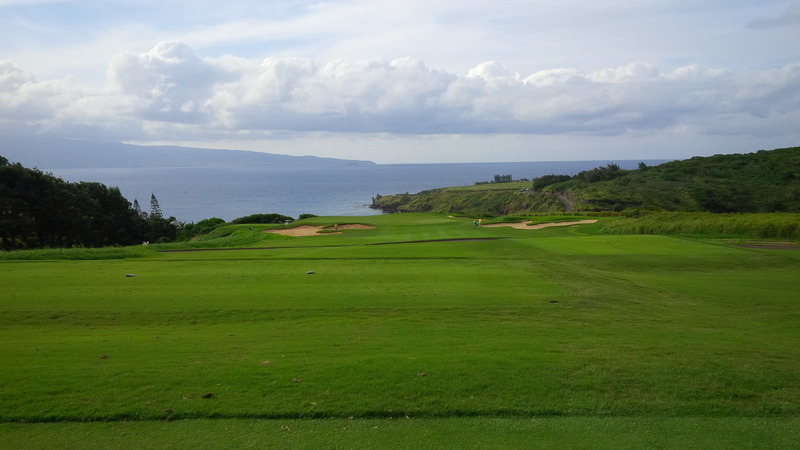 I can recall almost every shot I hit at Kapalua, which, for me, is a tell-tale sign of a great round of golf. So what if I carded an 88 on a par 73 golf course? It was still a great round that I hope I never forget. The Plantation Course’s 18th lives up to its considerable billing – it really is one of the best, most fun holes in golf. And honestly, I can’t recall a more gratifying golf feeling than that of the 380 yard drive I bombed down the middle of the (very downwind, downhill) par 5 18th hole of the Plantation Course. If you, Dear Readers, ever have the opportunity to play the Plantation Course, do yourself a favor and spend the (considerable) money to experience this slice of paradise. why is it called plantation ? The Kapalua resort was built on land formerly owned by the Maui Land & Pineapple Company, which grew pineapples on or near the land that the course is built upon.